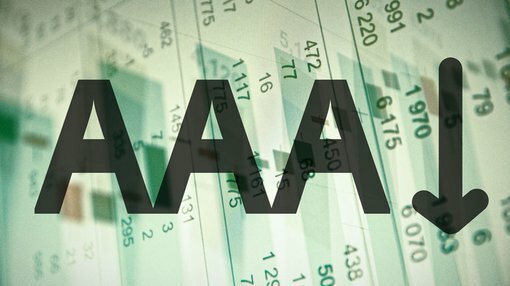 Will Australia lose its Triple A rating? As of 30 May 2016, the gross market value of Australian Government Debt outstanding is about $493.5 Billion writes Mike Cornips, Director at Options Educator, TradersCircle. The annual increase in the level of debt bottomed in June 2013 at about $16 billion, but peaked in March 2015 at $83.2 Billion. Over the past couple of months, we have seen an increase to an annual $83.7 Billion. It is better to look at the level of the market value of debt rather than the face value of debt to ascertain the level of Government borrowing to fund the deficit. The media tends to focus on the face value of the debt but if the Government issues $1 million of Bonds with a maturity of 21st April 2027 with a coupon of 4.75%, it doesn’t receive $1 million, it would receive $1,234,000 (23.4% more). This happens because the market price (ASX code: GSBG27.ASX) is $123.47, not $100.00. Because the regular coupon payment is 4.75% and the market interest rate is 2.31%, the market is prepared to pay more than $100 today because coupon payments are higher than the current rate of interest. 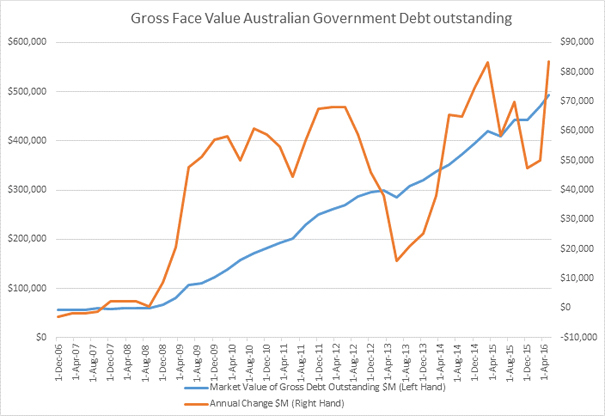 The media has been commenting on the ballooning debt issue in the context that both major parties are no longer focusing on the debt and deficit disaster. Currently our level of debt appears quite manageable considering $500 Billion is “only” about 30% of GDP. The problem is that the annual growth of debt (over 5% of GDP) is greater than other AAA rated countries. The issue then is not whether Australia can afford the debt (it can), but whether the external rating agencies lower our coveted AAA credit rating. Any incumbent Government that has the rating lowered during their term of Government will certainly cop a nose bleed in terms of fiscal responsibility.